These disposable plastic cold-drink cups and glasses are great for bars, restaurants, promotions, and events of all kinds. 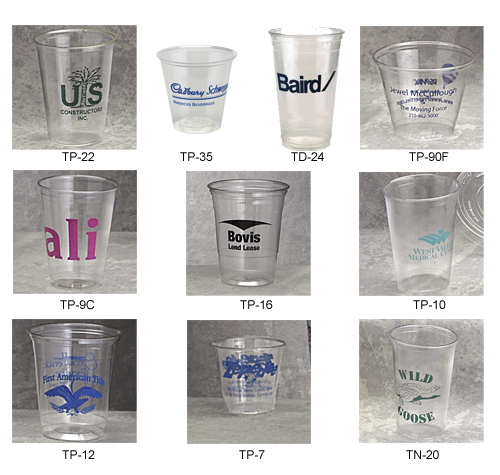 Plastic disposable cups and glasses are imprinted with your copy or design. Our plastic cups and glasses are designed for one-time use and are available in many sizes. Lids are also available for some cups. TP-35 5oz Sample Cup: 0.55 0.43 0.37 0.35 0.33 1¼" x 1"
TP-7 7oz Tall Cup: 0.55 0.45 0.39 0.35 0.30 2½" x 1¾"
TP-90F 9oz Old Fashion Cup: 0.55 0.46 0.40 0.36 0.34 2½" x 1½"
TP-10 10oz Tall Cup: 0.56 0.46 0.39 0.35 0.33 2½" x 2½"
TP-22 12oz Tall Cup: 0.66 0.60 0.51 0.48 0.46 2¾" x 2½"
TP-12 14oz Tall Cup: 0.86 0.79 0.66 0.61 0.59 3" x 2"
TP-16 16/18oz Tall Cup: 0.96 0.84 0.72 0.70 0.68 3½" x 2½"
TN-20 20oz Tall Cup Frost Flex: 0.99 0.93 0.80 0.76 0.72 3" x 3¼"
TD-24 24oz Tall Cup Frost Flex: 1.19 1.11 0.86 0.82 0.79 3½" x 2"
It's easy to get started with your Custom-Imprinted Disposable Cups – simply call 1-800-233-0828, and then e-mail your camera-ready artwork to graphics@kardwell.com (you can also mail your design). Production/shipping time is about 3 weeks. Rush delivery is available for an additional charge.